S&H Machine is audited annually, ensuring strict adherence to industry standards such as AS9100 and ISO 9001. The AS and ISO Standards are the governing quality requirements for top performing companies competing in the Aerospace, Defense, Industrial, and Medical Industries. ISO 9001 ensures that S&H Machine complies with the standards for Quality Management Systems including process management, resource management, calibration and measurements, purchasing and more, all while working towards continuous improvement. 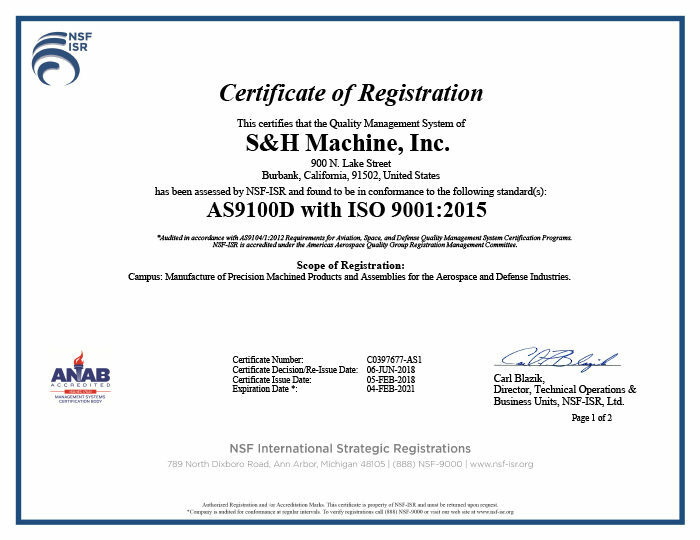 Our AS9100 certification shows we meet additional standards for quality and safety in the aerospace industry. S&H Machine is DDTC Registered and ITAR Compliant.